The tail is often described as the ‘crown’ of the breed. This is what it should look like. 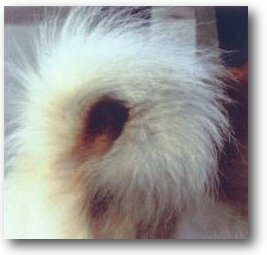 It should not curve too much and never have a double curl as is seen in the Elkhound, Keeshond or Basenji. 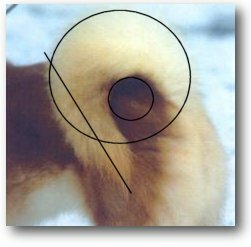 Neither should there be any gap between the tail and the back – even when the dog is out of coat. Let us begin with what the tail should look like. The tail is set on high and there is an immediate curve up, forward and then back. But the the curve straightens so that the end of the tail rests flat and virtually straight against the thigh. It is so easy for the tail not be be quite right. These two circles and the straight line are what you need to keep in mind. There should never be a ‘kink’ in the tail. Remembering the last image these are all clearly quite wrong. They are all too short and the set on and curvature of each one is greatly removed from what is desirable. They are extreme. The usual problem is a tail that is slightly slack at the root and one that should too much curve throughout the lower half.